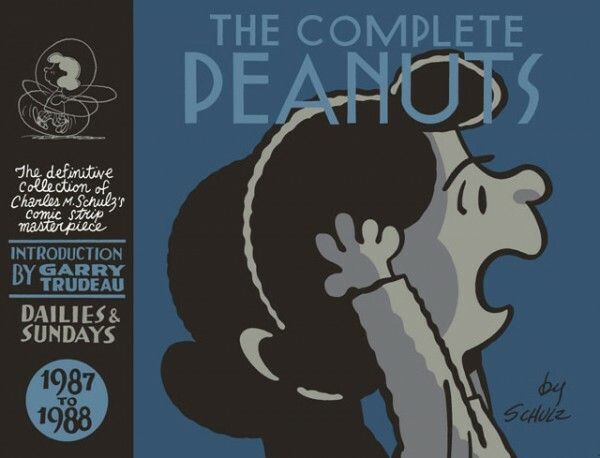 This latest volume in the long-running series is one that I know several readers of the strip and fans of Charles Schulz wanted to see when the series started: the time period when Schulz moved into three-panel dailies on a more regular basis. It comes in the second half of the book, and it's jarring at first -- you realize just how much of Peanuts' unique energy came from Schulz's ability to shape his characters' dialogue through silences, false starts and awkward points of discussion. With much of that ability gone, Peanuts is leaner and punchier and somehow slightly less recognizable. It does allow for the cartoonist to take some quick jabs that might not have worked at all with four-panle timing, like the December 1988 joke about gun registration, appearing below. How much you're likely to notice the shift more generally likely depends on where you find Schulz's value, how much you enjoy his rock-solid, well-earned credentials as a classic strip technician. The introduction in this issue is from Garry Trudeau, and gains some poignancy because its tribute to Schulz in the latter stages of his career comes at a similar point in Trudeau's own. It feels like a reminiscence about a world that doesn't exist any more, and in most ways Trudeau's right to characterize it that way. Trudeau appearing at all in one of the Peanuts volumes has a closing of the circle aspect to it as well. Trudeau was the original target to appear in the 200th issue of The Comics Journal, paired with Chris Ware. When Trudeau turned us down -- he turned us down more than once for similar treatment, is my memory -- Gary Groth decided to reach out to Schulz and put together the skeleton of the relationship that led to the Complete Peanuts series and Fantagraphics being able to move forward when financial troubles hit starting in the late 1990s. It's a good piece. Whether in the lifetime of a publisher or a strip, comics hangs on these kinds of subtle shifts.